The Stirling University men's golf team of Michael Lawrie, Laird Shepherd, Robert Foley, Jordan Sundborg and Alasdair McDougall finished joint 14th in a field of 16 teams at The Prestige at PGA West college golf tournament over the Greg Norman Course at PGA West, La Quinta, California this week. Shepherd achieved joint 46th individually on 150 (79-71). Foley (78-74) and Sundborg (74-78) shared 57th place on 152. Lawrie, pictured top right, had two 7s in a first-round 81 before returning a one-over 72 over the 7,100yd course in the second round for a total of 153 and a share of 65th place. McDougall finished joint 73rd on 156 with rounds of 79 and 77. 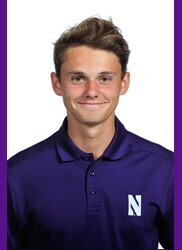 Two other Scots in the field of 84 players were Scottish U18 boys champion Eric McIntosh and Ryan Lumsden, both students at Northwestern University, Illinois. Lumsden, pictured below, finished joint 10th on 143 with rounds of 72 and 71. McIntosh shared 73rd place with scores of 79 and 77 for 156. Clay Feagler (Pepperdine) won the individual honours with scores of 69 and 66 for seven-under 135. Oklahoma State (567) won the team title ahead of Pepperdine (568) and Oregon (570) with Northwestern (577) sixth.